Peonies, of course, are superstars in spring weddings. Stock and Iris make them shine. Congratulations to Lis and Russell. Thanks for trusting me with your flowers on your special day at Fox Hill Inn. I sure had fun putting them all together! 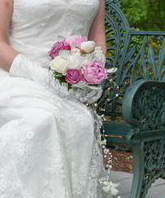 Loved the simple elegance of the bridal bouquet, with long string of pearls. Attendants carried posies individualized for the amazingly beautiful hues of each gown. Two rows of shepherds hooks framed the ceremony. Soft pink peonies, lavender, cream, and pink stock, and lovely purple iris shined. A very dear way to showcase the ceremony, which took place in front of Fox Hill Inn's dramatic fountain. Rose petals lined the outdoor aisle. A wrought iron urn graced with peonies welcomed guest into the Inn. Feathery Astilbe added a dreamy softness. Curly willow branches leant their artistic magic. Dusty rose petals and votives graced the mosaic table. Dining tables also showcased the lovely spring palette of dusty rose, heavenly pink, irresistible lavender and soft creamy yellow. Centerpieces in mercury glass pedestal vases were spectacular to create. Lily of the Valley offered a fragrant finishing touch. Loved the wine bottles the bridal party used for numbering the tables. All in all a very nice evening for a wonderful couple and their families and friends. Thanks to Lis and Peggie, for sharing a lovely cup of tea together and making floral planning such a fun, exciting, and pleasant experience. Thanks also to Patty Finnigan, General Manager of Fox Hill Inn and to Ewa Ojarovska, Event and Hospitality Consultant extraordinaire of Epicurean Worldwide. Love your photos, Mike Evans, of CT Photo Group.